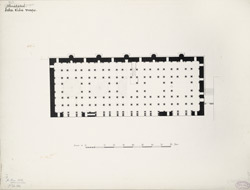 Pen-and-ink plan of Sakar Khan’s mosque at Ahmadabad, Gujarat, by Sitaram Dinkar (fl. 1875). This image is from the Burgess collection, an album of 49 drawings of plans, sections, elevations, sculpture and architectural details of Muhammadan monuments in Ahmadabad and the surrounding areas made between 1884 and 1886. The drawings were prepared mainly by Indian draftsmen under the supervision of James Burgess (1832-1916). Situated on the banks of the Sabarmati River, Ahmadabad was founded by Ahmad Shah, Sultan of Gujarat, in 1411 on the site of the village of Asaval. The dynasty ruled until 1537 when Sultan Bahadur Shah was killed by the Portuguese at Diu. Gujarat was annexed by the Mughal emperor Akbar in 1572. The city is architecturally interesting as it boasts many examples of fifteenth- and sixteenth-century Gujarati provincial Islamic architecture. This drawing of the plan of the sanctuary of Sakar Khan's mosque in Ahmadabad is an example of the Gujarati architectural style. The sanctuary comprises five bays each topped by a corbelled dome surmounting the pillared interior. There are five 'mihrabs' or prayer niches with corresponding ornately carved projections from the back of the 'qibla' or directional wall. The mosque is constructed using local trabeate or post and lintel methods drawn from indigenous Hindu and Jain temple traditions.